Days of Blood & Starlight is the sequel to Laini Taylor’s Daughter of Smoke & Bone, a YA fantasy novel of angels and demons that is both chilling and unputdownable. This post will contain spoilers from the first book, so if you haven’t read it, stop reading now. In a parallel world to our own, the chimera are at war with the angels. Unlike in our own heavenly mythology, there aren’t really clear-cut good guys and bad guys. Both sides have been at war for so long that they have no collective memory of peace. Two young lovers once imagined another way of life, but that was before the angel Akiva ordered the genocide of Karou’s entire city. 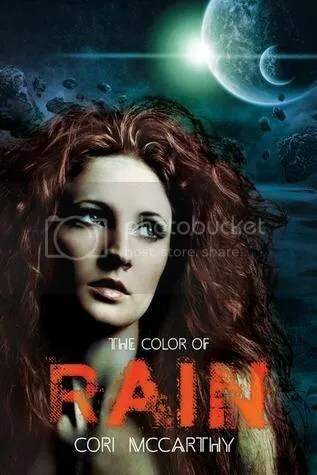 Now, Karou and Akiva are two lost souls with the power to change the world, but an unbreachable rift between them. Akiva has returned to his position in the angel army, but killing chimera no longer feels right to him. His disillusionment with war begins to spread throughout the angel ranks, providing a glimmer of hope. Meanwhile, Karou has returned to the chimera and is using her power of necromancy/restoration to breathe new hope into the chimera’s fight. However, the chimera army is being led by Karou’s unscrupulous almost-ex-fiance, and Karou constantly feels unsafe among her own people. 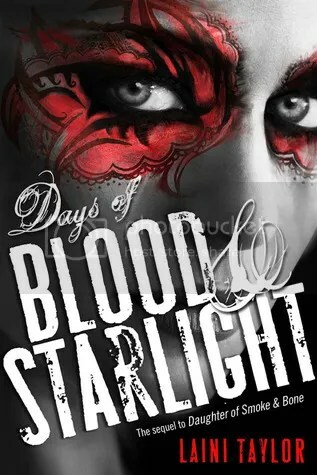 Days of Blood & Starlight is fast-paced and suspenseful. We see both Karou and Akiva struggling with their own beliefs, but even at their darkest moments (and there have been plenty of them so far), you can tell that neither believes that war and violence are a productive way for their peoples to move forward. It is heartening to see both Karou and Akiva inspiring others by their example. And the cliffhanger ending… so dramatic! I can’t wait for the final book in the trilogy to be released so that I can see how it all comes together in the end. I’ve been following Sarah Rodriguez Pratt’s blog, That’s a Girl’s Car, for a long time now, and when she contacted me about reviewing her book, I was thrilled to accept. Choose Your Weapon, the first book in the Helen of Hollingsworth Trilogy, is the story of a dragon-slaying high school girl trying to find her identity. As a child, Helen loved the Glorious Dragonfighter books. She also knew something that most people did not. The world of Erwingdon isn’t just a fantasy, and people from our own world travel there in their sleep to help fight dragons. Recruiting warriors from our world is better, of course, because if someone dies in Erwingdon, they only die there, and not in real life. Helen was supposed to join the ranks of the warriors and become a Dragonfighter, but then one night, all communication with Erwingdon stopped. Years pass, and Helen loses touch with her nerdy interests because she sees them as incompatible with having a social life in high school. Out of the blue, Helen is summoned back to Erwingdon. The land is under threat by powerful dragons, and the people there have again called upon our world for aid. Helen is grateful to be back, but not so thrilled that her new comrades are people she knows from school. Helen must discover her own inner strength and learn to get along with her classmates in order to have any hope of saving the world. Choose Your Weapon is kind of like Narnia for teenagers, but without the whole Jesus-lion-allegory thing. Helen’s got the same issues a normal teenager does. She feels like her interests aren’t good enough and that she can’t speak out in classes and still fit in. She’s got a crush on the head of the academic quiz team, but doesn’t know how to act on it. She’s also just lost her best friend, who ditched her to hang out with the dance team. Helen also has problems in Erwingdon. She’s not particularly athletic, and fighting dragons requires a lot of coordination. She’s also the only girl. I liked the fact that Helen was awkward and yet believable. She’s the kind of teenager that a lot of us remember being, and I was constantly rooting for her as she began to come into her own. 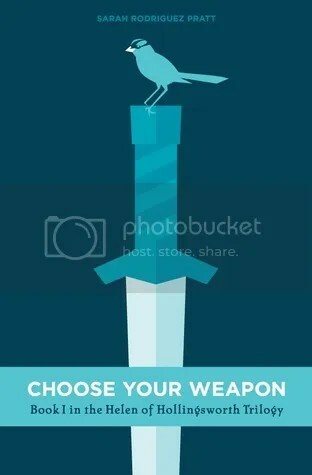 Choose Your Weapon focuses on finding one’s inner strength rather than succumbing to peer pressure and apologizing for being oneself, and that’s an important lesson for teens and grown-ups alike. This book rocks! Sarah is a sophisticated and talented new writer, and I can’t wait to see what she comes out with next. 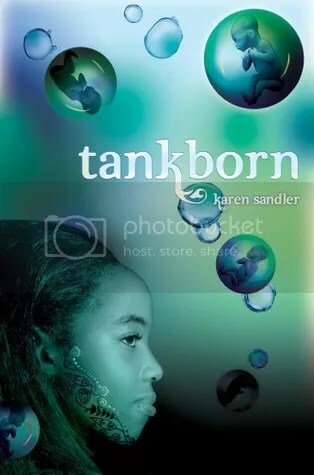 Back in June, I won a giveaway at The Book Smugglers for Karen Sandler’s novel Tankborn and its sequel Awakening. The books are from Lee & Low, a new publisher focusing on multiculturalism and diversity in children’s and young adult literature. Their mission is something that I fully support, and it’s especially heartening to see some of their science fiction and fantasy offerings. Kayla is a GEN, short for Genetically Engineered Non-human. The GEN don’t have parents in the traditional sense; they’re born using a tank and then fostered. When a GEN is 15, he/she is given their Assignment, sent to work as slaves for the humans on Loca. The GEN are marked by prominent tattoos on their faces, making it impossible to be mistaken for another social class. Kayla’s friend Mishalla begins her Assignment first, but finds that something’s amiss. Her task is caring for low-class (but not GEN) babies, some of whom have been injured. Mishalla realizes that everything isn’t as it seems, and that the humans she works for are involved in something shady. As Kayla begins her own Assignment, she begins to question what she’s been taught about the roles of the GEN and humans. She meets an upper-class human teenager named Devak, and the two begin to fall in love. Personally, I found Devak to be a bit insufferable for most of the book, but it’s understandable because he’s a teenager who has led a relatively privileged life. For most of his life, the plight of the GEN was something that could easily be ignored, and even though he’s always been kind to the GEN, it wasn’t until meeting Kayla that he really started to get it. Sandler uses Kayla and Devak’s story to explore how racism can become ingrained in culture. The social classes in Tankborn are rigidly enforced, and appearance is a major determinant of one’s social position. GEN do go to school, but their lessons are geared toward their capacity as workers. Even the GEN religion points to fulfillment only by serving humans. The GEN and the upper classes are taught that there are major differences between them, and that even touching one another can have serious consequences. Kayla and Devak both have to challenge their prior assumptions and take risks to be together. Overall, I’m a big fan Tankborn. Kayla and Mishalla’s intertwined plot lines are filled with mystery and intrigue as they discover the real history of the relationship between the GEN and humans and fight to break down the social barriers between them. I can’t wait to read the sequel. 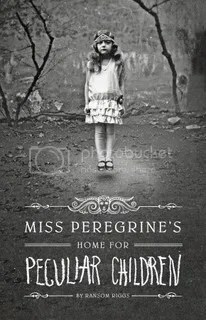 My review of “Miss Peregrine’s Home for Peculiar Children” is a part of a mini-review series to write about books that I read while on blogging hiatus last fall. I had originally planned to write about it during the R.eaders I.mbibing P.eril challenge. Jacob’s grandfather has always told him wild and imaginative stories. At 16, Jacob dismisses them as mere tales, but when his grandfather is murdered, he begins to wonder if there might not be a grain of truth in them after all. Seeking to discover his grandfather’s secrets, Jacob travels to Wales to visit the orphanage where his grandfather was raised. There, he discovers a world distanced from time and populated by peculiar people with psychic powers. As I read Miss Peregrine’s Home for Peculiar Children, I found myself continually pondering whether the children were real, or a figment of an overly active imagination. It is the story of the magic and ideals of childhood being intruded upon by the harsh realities of the grown-up world. This is the kind of book that you engage and interact with. It is interspersed with vintage photographs, giving it an eerie and vaguely sinister quality. I would recommend the physical book over the e-book because the visuals play such a key role in building the story’s atmosphere. I read the Kindle version, and although there’s nothing wrong with it, the hardcover editions are gorgeous and would give the pictures even more prominence. A few days ago at work a library patron brought in this book as a donation for the staff book exchange. “Please don’t judge me, it’s YA,” she said. “And it was really good.” Based on her recommendation, I decided to borrow it for the weekend. 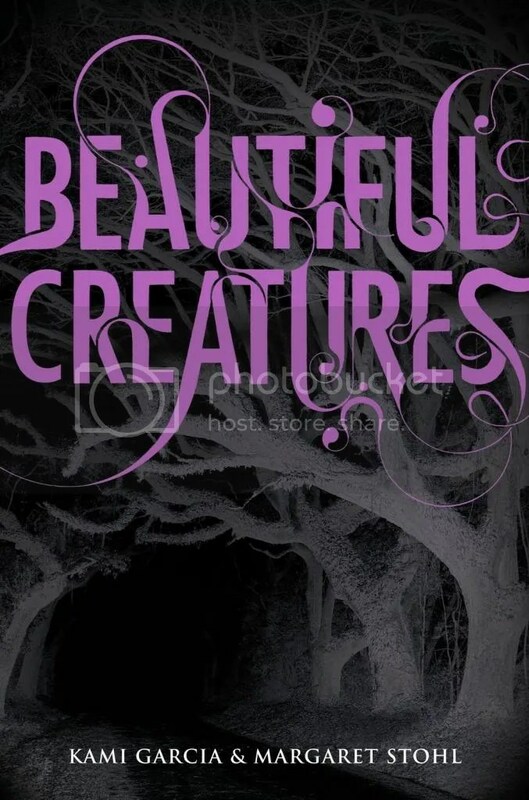 “Beautiful Creatures” isn’t the type of book that I’d have found on my own. There’s a blurb on the back saying that Twilight fans would love it, which almost always sets of alarm bells in my head. At the same time, one shouldn’t judge a book by its cover, and I’m glad that I decided to give this one a chance. It’s not perfect by any stretch of the imagination, but it was a fun read on a relaxing weekend. Turns out, I couldn’t have been more wrong. Ethan is a normal teenager growing up in a rural Southern town. It’s the kind of place where everybody knows everybody, and people generally spend their entire lives there. Ethan’s on the basketball team, and outwardly fits in with his peers, but he also loves reading and dreams of leaving Gatlin once he graduates. Ethan’s life is forever changed when a new girl named Lena Duchannes moves into town. As the two teenagers fall in love, they discover that not everything in Gatlin is what it seems. There’s an obvious supernatural element, but I’m not going to get into it here, because the gradual introduction and revelation of the magical elements were part of what made this book fun to read. Gatlin is the perfect setting for this novel. The authors pay close attention to detail, from the Civil War reenactments, the DAR ladies, and the town rivalries and superstitions. It makes a wonderful setting for a Gothic/paranormal novel, and it was one of the things that sucked me into the book. I wish that the book had a little bit less emphasis on high school, but at the same time, I give the author a lot of credit for their perspective on it and for getting it right. Gatlin reminded me a lot of the town where I grew up (albeit slightly less extreme). It’s the kind of place where everybody’s known everybody since preschool. Lena’s the new girl, and she’s different. She wears the wrong clothes, the wrong shoes, and doesn’t interact like a normal person. That’s why Ethan likes her. At the same time, Ethan sets himself up for the same alienation when he begins hanging out with her. The authors capture all the awkwardness and alienation that you get for being yourself instead of following the unspoken rules of high school. I liked that the drama wasn’t a love triangle, but rather the conflict between following one’s convictions and fitting in with the crowd. My favorite character in the book is Marian, the librarian, who runs both the public library and a secret magical library. In the struggle between the forces of light and darkness, she takes a strictly neutral position, and doesn’t get involved except in the context of her work as a librarian. Even though the book did a lot of things right, there are still a few things that annoyed me. Just basic typical YA book/movie tropes, like the supernatural significance of the 16th birthday, or a curse that seems oddly specific for no reason whatsoever. Also, the ending didn’t really make sense, and could have been thought out a lot better (Really? The moon is obscured so she doesn’t get Claimed and gets to be both good and evil? Have there not been clouds for the past 150 years?). Despite its problems, I did enjoy “Beautiful Creatures.” It reminded me a bit of late 1990s Disney Channel movies, so there was definitely a nostalgia factor at work, even if some parts did make me roll my eyes a bit. It makes good beach or vacation reading, where you don’t want something that involves too much thinking, but are still looking for a book that will make you forget about the world for a while. At the same time, I don’t feel the need to read the sequels. Can you believe that Armchair BEA is almost over? This is the last day of the themed discussions, and tomorrow I’ll post a wrap-up of the event. What exactly does “keeping it real” mean? The meaning lays in keeping. How do you not only grow an audience, but how do you keep them coming back for more? If you have been around for years, how do you keep your material fresh? How do you continue to keep blogging fun? One of the main things that I like to remember when blogging is that if it stops being fun, I’m doing it wrong. Generally the combination of reviewing books and participating in the occasional event has worked well for me. I’ve also started participating in book tours, because I like being able to discuss a book that I’ve read with other bloggers. It’s the discussions and overall level of excitement that I see in the blogosphere that keep me coming back for more. One thing I plan on doing in the near future is a slight re-design of the look and feel of my blog. While it currently works for me, I noticed since I came back to blogging that WordPress has added more themes that have a sleeker look and better social media integration. I’d also like to re-do my avatar, because I got glasses back in January and wanna make her look as close to what I look like as possible. I always wonder though when I update the look/feel of my blog whether I’m making it harder for people to recognize. Thoughts? Our final genre focuses on the younger crowd: children’s picture books and young adult literature and everything in between. What are the top 5 (or more) books that every child should have on his shelf? If you are an adult who reads YA, why do you keep going back for more? If you are not a reader of these books, think back to your childhood and share your favorites from your younger years. 1. “A Wrinkle in Time” by Madeline L’Engle – I’m still enchanted by the Murray family of Madeline L’Engle’s Time Quartet. As a child, they showed me that it was okay to be different, that it was okay to want to learn, and that religion and science didn’t have to be mutually exclusive. 2. “Miss Rumphius” by Barbara Cooney – Beautiful illustrations, and a theme of making the world a more beautiful place. It inspired me to plant lupine seeds all over my neighborhood. 3. “The Little Prince” by Antoine de Saint-Exupéry – A sad story, but a reminder of the power of a child-like perspective on the world. 4. “Mary Engelbreit’s The Snow Queen” by Hans Christian Andersen – A gorgeously illustrated edition of the classic fairytale. 5. “The Story of May” by Mordecai Gerstein – A little girl travels to visit each of the personified months of the year. I was saddened to discover that it’s out of print. I’ve got a love/hate relationship with YA. There are a lot of brilliant YA novels out there, but there are also a lot of duds. I have a hard time finding the good ones, and it irritates me to no end when an otherwise good story is ruined by love triangles and teenage angst. Even when I was a teenager, that kind of drama annoyed me. Sometimes it makes me want to swear off YA for good. But then, books like Seraphina, Bitterblue, and Katya’s World remind me that I’m being unfair, and that young adult novels can contain imaginative new worlds populated by strong and resilient protagonists. What are some of your favorite childhood or YA novels? I received a copy of Jonathan Howard’s novel “Katya’s World” from the publisher in exchange for an honest review. It is one of the first books books released through Strange Chemistry, Angry Robot’s new YA imprint. Based on this book, I can’t wait to see more! 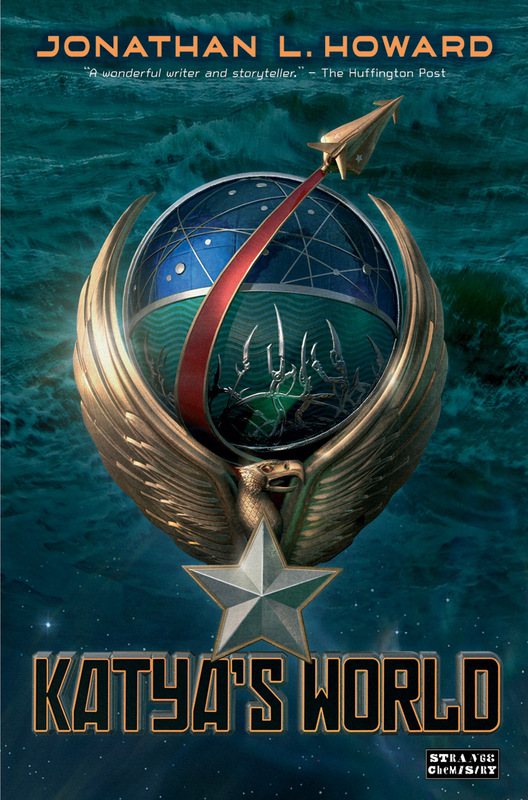 “Katya’s World” is science fiction set on the planet Russalka, a colony world founded by Russian immigrants from Earth. Russalka is an aquatic world with abundant natural resources, which made colonization a viable economic decision at the time. However, political problems on Earth meant that the colony was ignored and left to fend for itself. The harsh climate and lack of any actual land surface created a resilient and independent people. Katya is on her first voyage as a submarine navigator with her uncle Lyukan when the military asks her to assist in a prisoner transport. This isn’t normal, and both Lyukan and Katya resent the interruption of their command. However, when the ship is attacked by a sea monster dubbed the Leviathan, Katya, Lyukan, and their mysterious prisoner find themselves caught up in a struggle that could threaten their entire world. Over the past few months, I’ve been attempting to find YA novels that aren’t the same old tired story of love triangles and teenage novels. This one is a winner. Not only does it lack love triangles, but it doesn’t have a love story at all. Quite frankly, it doesn’t need one. Katya is a young woman making the first steps in her career, and is going through the phase where people who would normally be authority figures are now becoming colleagues and asking her to help make decisions. She’s young, spunky, and confident, and her problems revolve around carrying her passengers to safety and fighting sea monsters. I was also impressed by the world building, because the entire idea of living on a planet without a land surface is something that I haven’t read about before. Howard explores themes like ethnic identity as he creates a people with Russian ancestry but who have lived on Russalka for so long that they no longer identify themselves with the people of Earth. Overall, I’d highly recommend this one. While I read it a couple months ago, I’m including it in The 2013 Science Fiction Experience, as I’m only getting as far as reviewing it now.